Most of us know about Ebay, and anyone who's used it a fair bit, will probably have mixed feelings about it! At the end of the day, it's a GREAT place to buy used "stuff" but you've got to know what you're buying! Although these work on the 40 channels that are now known as the EU band (sometimes called the "mids") AM is not compatible with the UK FM units so these CB's are almost useless for anyone wanting to keep in touch with a bunch of their mates. Click here for more info on the 2 CB bands we have. The trouble is, the sellers don't always say anything about this, and "caveat emptor" effectively means you have to make sure - for yourself - that what you're buying is ok. So, we've produced this page and introduced a unique email "legal/illegal" service to our website visitors! These are generally easy to spot as the approval regulations of the time required that a circle mark with "CB 27/81" in it. CEPT (PR 27 GB) - The original specification for 40 channel EUROPEAN band CB radios. Rigs with this mark are legal to use in the UK and Europe. Obviously CEPT rigs are not compatible with CB 27/81sets. MPT 1382 (PR 27/94) - A later specification for UK band CB's, replacing CB 27/81 (MPT1320), using exactly the same frequencies but with a higher standard for filtering, case radiation, channel rejection etc (in an effort to cut down interference to domestic TVs and radios). MPT 1382 rigs are entirely compatible with CB 27/81 units. MPT 1382 (marked "PR27/97 - for use in UK only") - This is the specification for the 80 channel CB's - introduced in December 1997. Although these CB's have the European band, they also have the UK band, which makes them "illegal" in Europe, hence the "for use in the UK only" bit. European Multi Standard - I am researching the type approval specs for these sets currently, although it appears a general "loosening" of restrictions in line with European attitudes means that these are legal to use in the UK and Europe, and would only become illegal in the UK if you were to transmit on AM or on channels other than our legal 80. 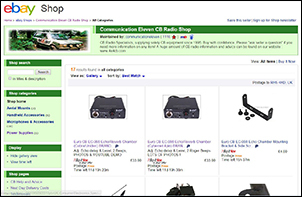 In short, if you look out for the marks shown in the picture opposite (courtesy of Ofcom, the Radio Regulatory body, whose site you will visit if you click the image), you should be ok.
Obviously with an Ebay buy, you might not be able to see any marks - the original CB 27/81 circle had to be on the front facia of the unit, but the rest could be anywhere, the MPT ones are usually on the back. Ask the seller if theres' any type approval markings on the set and see what they say! There have been many, many others but the above are the most commonly found sets. Many of these manufacturers did at some point bring out CB's in other countries, that wouldn't be legal here, so there will always be exceptions to the rule, and i guess i should put some kind of disclaimer here to the effect that i cannot be held responsible if you buy a rig thats badged from one of the above manufacturers that turns out to be illegal! *The CB 934/81 mark denotes a band of 20 channels we were given in 1981 way up the band at 934Mhz. This band has been removed and that part of the radio spectrum is now (supposed to be) used for mobile phones, and operation of 934mhz equipment is illegal full stop. **Two exceptions to the "modulation meter" rule that i can think of - Kernow Beta 2100GTL, and Team Euro 8000 (base station CB), both these units are legal. Hopefully this page has told you what you need to know but if you still don't know if the cb rig you propose to buy on Ebay is legal or not - send us a link to the auction! I can have a look and give you my OPINION on the rigs legality. 28th September 2005 - Please Read!!! Today i have answered 3 emails from people wondering why they cannot get anyone on their newly aquired (from Ebay) CB Radios. This is because they are being sold old illegal CB's which don't work on the UK band. There seems to be A LOT of this going on - please be aware that Ebay seems to be full of people wanting to make money out of peoples ignorance and sell useless (and illegal) CB's to people. There is no comeback on these people unless they specifically describe the unit as "legal" - and even then they will claim ignorance themselves... it really is Caveat Emptor - literally translated as BUYER BEWARE! !